What else would you alter if you only had 1lb of beef? Would you go ahead and half everything? With 1 lb. I would fill it up with red peppers, diced carrots, more potatoes, some sauteed . That sounds delicious – or you could even add in beans for a whole new flavor. If you didn’t have cream of mushroom, what would you use? cream of celery would work well too. What seasoning did you use for the hamburger potato casserole? Have you ever boiled the potatoes first to cut down on cook time? This was so yummy thank you! I needed some comfort food and this good old fashioned casserole did the trick. I used cream of potato cause I’m not a fan of mushrooms but otherwise followed your recipe and I wouldn’t change a thing. The hubs loved it too and he can be picky! I cooked the hamburger with a little onion and used cheddar cheese soup instead of cream of mushroom. It was delicious! I made this and liked it very much . Then today I made it again and I added onion and green bell pepper. . It’s in the oven now ,so I can’t tell you how it taste…thank you for sharing your recipe . This looks delicious, but my husband doesn’t like cheese. Could I leave it out? I tried this tonight and it was delicious! Thank you for the recipe! My husband doesn’t like cream of mushroom soup, so I used cream of potato soup and it seemed to work great. I make this same casserole with ground beef or any leftover meat I have but I do add onions. I have also added frozen sweet peas with carrots which my family likes. This is even good meatless. Could I substitute the beef with chicken? My kids, all boys, do not like beef, but love chicken. I used 1 lb pork sausage 1 lb beef. It gave it a little spice that was nice in it. Can you use cream of chicken soup? Can I use cream of chicken soup instead of mushroom? Have you ever tried hash Browns instead of peeled potatoes? 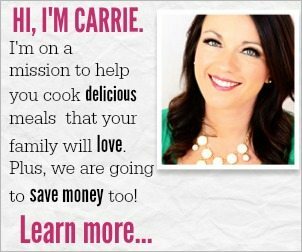 Carrie, rather than using sliced potatoes can you sub frozen hash brown potatoes? This is in the oven as we speak. I’m so excited. It looks awesome. I can’t wait until it’s done. I just put this in the oven. I did substitute 1/2 pound of hamburger with pork, only because I had it in the freezer and needed to use up the pork. I also added 1/2 a large onion to the meat while it was cooking. And, substituted cream of chicken – again, because I had it in the pantry. I am anxious for it to finish cooking. Thanks for the recipe. First time making this meal!! It looks delicious!! Looking forward to try this tonight It’s a weeknight I don’t want much of a mess in my kitchen after dinner. I think I’m going to add some frozen mixed vegetables with that however Thanks for the recipe. About how many will this serve? Cook then freeze, if making ahead, or freeze then cook? Can I use chicken broth instead of cream of chicken? Freeze then cook. Thanks Sylvia! Can i use cream ofcheddar ,soup no cheese on top n a can od peas n cartots? Yes, I think that might taste great! This hamburger casserole is a great dish! I’ve made it several times over the winter, my teenage son loves it, and I’ve served it to company. So far, everyone who’s tried it loves it. Thank you! There are no seasonings in this recipe. Does it still have some flavor? I think I would definitely add finely chopped onion. My grandkids won’t see the onion amidst other ingredients, but that would add some flavor. Great idea, Hide and seek works well in my family. I mix the cream of celery soup with cheddar cheese soup since I didn’t have much shredded cheese. I had some green onions, chopped. I also make a brown gravy. My husband doesn’t like cream of Mushroom soup. Side salad, he said it’s a keeper. Thank you, for a e-z dinner. ? Added onion & garlic to the hamburger while cooking, and added 2 cans of sweet corn in the layering. I also topped it with sliced green onions. Very tasty! I’ve made pretty much the same casserole for years except I’ve always used spicy pork sausage. It IS easy, few ingredients, and family LOVES! Melissa – I have not tried this before but I don’t see why it wouldn’t work. Let me know how it turns out! Thank you! Made this awesome dish, highly recommend!! to try it. So delish with flavor. We used fresh grated potatoes like hash browns. On my like list to make ??? If I cut the recipe in half, do cut the time in half too? Julie – I haven’t tried this one in the crockpot before but I think it might work. I would try layering the ingredients the same and cook on low for 6-8 hours until the potatoes are done. Let me know how it turns out! Patrice – If you still use a 9X13 pan than I would cut the time in half as well. If you are using a smaller pan, than I would keep the time the same since the casserole will be thicker. This is a great & easy recipe! I add about 1/4 c. Sour cream, grated onion and maybe 1/8 half & half. Do slice potatoes thin! Next time I will try frozen hash browns.